What do you do when your dog loves going outside more than anything, but you worry about them being exposed to the elements? You buy a dog house! Dog houses are a great way to give your dog their own special home in your outdoor space where they can relax, sleep, and find shelter from the rain, sun, or wind. While some dogs are indoor only dogs, other dogs spend just as much time outdoors as indoors, so having a dog house is key to keeping them safe. Choose a dog house that is big enough that your dog can go inside, turn around, and lie down. Don’t choose anything too big for their size or they may start to go to the bathroom inside! 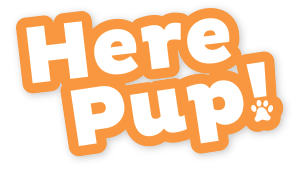 Here are some of the best dog houses from the market; find your perfect match! This can easily be considered the best outdoor dog house for its great design, good-looking exterior, and durability. The house features a raised floor which keeps your pet dry and cool, and the roof of the house is made of asphalt. Additionally, there’s a durable weather-resistant liner inside the roof as well, which will prevent inclement weather from affecting your dog while they’re inside. One of the most loved features of this house is its self-leveling, water-resistant plastic feet. These feet self-adjust to keep the house level, so you can even put the house on slightly uneven ground without any problems. 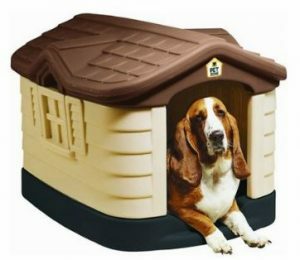 The Pet Zone Cozy Cottage Dog House is the best-insulated dog house we could find on the market today. 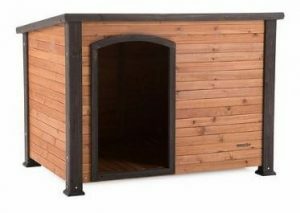 While it isn’t as insulated as a human house, this house will do a great job of keeping your dog warm in the winter and cool in the summer. Additionally, the house is made to look good and last for many years. The vents and roof can be adjusted for ventilation and cleaning purposes. The color on the outside is UV resistant so that it won’t fade too quickly. If you want an insulated dog house that will look cute in the yard for years to come, try the Cozy Cottage! 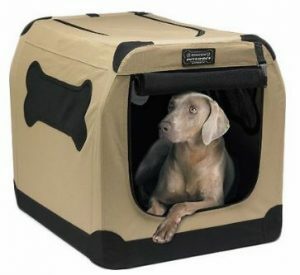 Another one of the top rated dog houses is the Firstrax Petnation Port-A-Crate. This particular home is very different than its competitors because it is actually made to function as a home inside and outside. It’s got the durability needed to stand up to wind and rain outside, but is also lightweight enough to be moved indoors. This means that your dog can get used to having the same home indoors and outdoors, no matter what the season is! 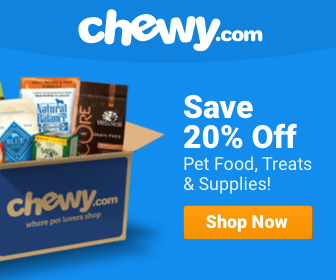 For picky dogs who like things to stay consistent, this is the perfect option. The Suncast DH350 Deluxe Dog House is an incredibly detailed and effective dog house made for areas where there isn’t a lot of snow or wind. The plastic isn’t thick enough to withstand very strong winds, but it can be great for sheltering dogs from rain and sun. 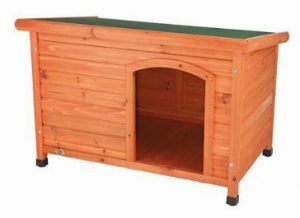 This particular dog house is very lightweight and easy to assemble, making it a good option for those who are looking for a temporary or easy-to-use dog house for their lovely pet. A nice touch on this dog house is the inner channel that will collect any liquid your pet brings in for easy cleanup purposes. Your pet won't get wet inside of this dog house! 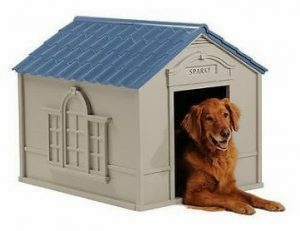 The final dog house I’d like to introduce today is the Trixie Dog Club House, which is one of the best dog houses for large dogs thanks to the huge sizes available in this style. The design of this large house is great for dealing with elements. The off-center door prevents wind and rain from getting inside, and gives your dog a dry area to lay in at all times. The weatherproof finish does a great job of keeping out wind, rain, and drafts as well. The roof is also very unique. It’s made in two sections which can be propped up for ventilation in hot summer months. This feature also makes it super easy to clean the dog house! A paradise for large dogs who like spending time outside, the Trixie Dog Club House is a fantastic option for many pet owners. Your doghouse doesn’t have to be a place where your dog can live 24/7, but it should somewhere that they can safely take shelter while outside. This type of shelter is important for a dog’s bodily and mental well being, so take this need seriously. 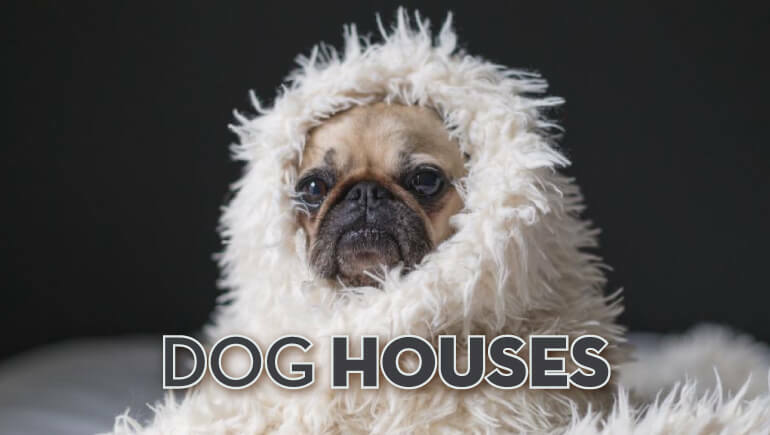 Remember that while many dog houses do not have insulation, the best dog houses offer enough removal from elements like wind, rain, and sun to be a significant improvement over having no dog house at all. What kind of dog house do you prefer to look at for your dog? Let us know your style loves in the comments!